Recent benchmarks for iPhone 5 were very impressive, but now those impressive numbers have been broken by another Apple product: the iPad 4. 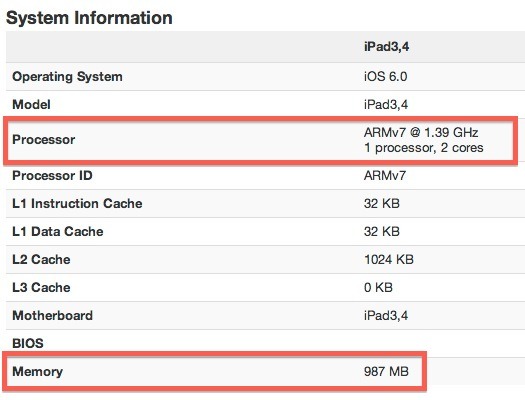 Not only is the iPad 4 faster than the brand new iPhone 5, it’s much faster than the iPad 3, offerring over two times the performance of the previous model. For those who like the technical details of performance, the iPad 4’s speed boost is achieved with an A6X dual-core 1.4GHz processor alongside 1GB of RAM, as revealed by the Geekbench app where the benchmarks came from. The A6X CPU at 1.4GHz is slightly faster than the A6 CPU included in the iPhone 5, which runs at 1.3GHz. You can see the full benchmark information at PrimateLabs, and you can download the GeekBench app yourself and run it on your own devices to see how they stack up. It is not 2x faster than, as it says in the title. It is a little bit more than 2x the speed of, or a little bit more than 1x (100%) faster than the iPad 3. Is it necessary? App developers make sure their apps run on the iPad 2 untill the iPad4 so most of the apps wont take advantage of the better specs. Damn i missing the values of the iPad 1!